American Hustle’s stellar cast sets it up to be one of the most promising films of the year; but does it deliver? After federal agent Richie DiMaso uncovers con artist-couple Irving Rosenfeld and Sydney Prosser, they are forced into working for him to con and bring down some of the largest politicians, senators and mafia members in New Jersey. This film is all about characters, with their development coming largely from a clever use of Irving and Sydney’s con artist origins backstory to set the film up in flashback format. This lasts for almost an hour, and by the time we return to the current day scenario we’re fully equipped to understand the situation, developing the characters further with stressful situations that now offer an effective reason to root for the leads. This is combined with providing some extremely funny moments, like when Irving takes great care to cover his bald spot only for DiMaso to mess his hair up. This jump back in time provides a great opportunity for Christian Bale and Amy Adams to flex their acting muscles, with never a dull moment in sight. It would be unjustified to say that one single character stole the show as each of the five leads bring something unique to the line up. However, Irving (Bale) and Sydney (Adams) are always the centre of attention; it’s their love for each other that makes them endearing to the audience, despite never quite letting their guard down. While each of the characters seem to have their individual virtues, it’s really their sin and desire to con other people that make them stand out, “The best perfumes in the world are all laced with something nasty.” – this underlines the manipulation and complexity that each character is capable of; even the lovers Irving and Sydney have their issues, outlined by Sydney’s affection for Richie and Irving’s destructive wife, Rosalyn. Individually, the five lead characters each display a fantastic and memorable character, but it’s their relationships and interaction with each other that really drive the story and keep an energetic pace. With the majority of them seemingly masters of lying, conflict was always going to allow heightened, and sometimes faked, emotion to create brilliantly whacky and hysterical scenes. Due to Irving and Sydney’s affair and a continually changing plotline, each member of the leading five has continually got some kind of disagreement with another, in particular Irving, and both his wife, Rosalyn, and his unwanted boss, Richie. 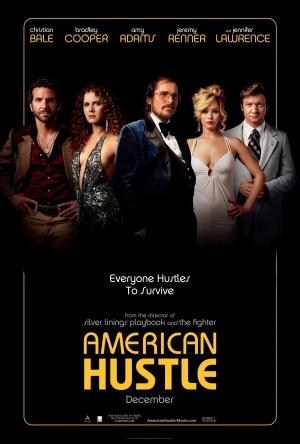 American Hustle is an intelligent, well constructed film to place amongst one of the best crime films of recent times; with a brilliant set of characters and a wonderful cast to complement them - what an end to 2013.